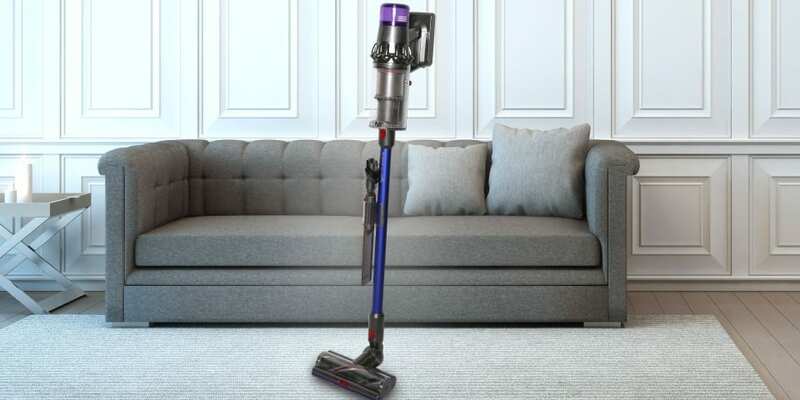 Dyson has unveiled its latest cordless offering – the V11 – and claims it’s not only super intelligent but also has 20% more suction power than its predecessor, the Cyclone V10. It’s also the most expensive yet, with the top-end V11 Absolute costing £600. The V11 looks similar to the V10, but it has some pretty tempting updates which set it apart from rivals. The most eye-catching is the smart digital display, which tells you how much battery life you have left and refines its estimates over time. 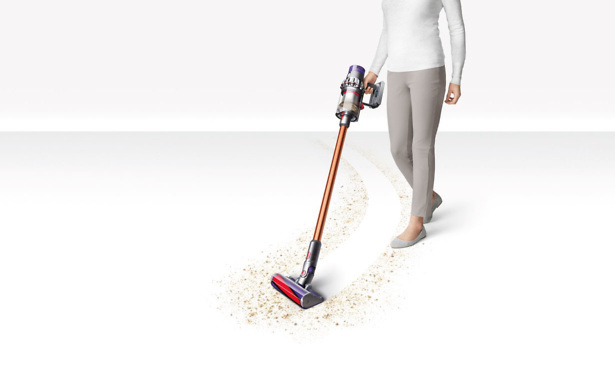 The Absolute model also comes with an automatic cleaning mode, which adjusts suction to suit the floor type, saving you having to switch as you go (and optimising your battery life). But is it really worth a jaw-dropping £600? Get an overview of what’s new in our video above, or head straight to our Dyson V11 first look review to get our verdict on the new model. Read on for more on how it compares with rivals on features and spec, including the two things we think hold it back. Dyson V11 cordless: what’s new vs the V10? Both V11 models come with a dynamic digital display. This tells you which cleaning mode you are in and gives a to-the-second battery life countdown – making running out of charge halfway through the house a thing of the past. 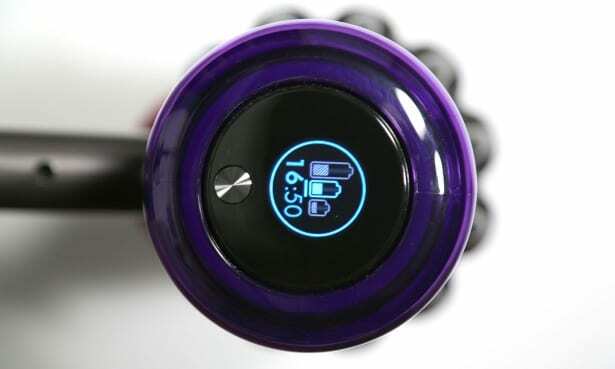 Dyson says the V11 constantly monitors performance and fine tunes battery estimates over time, taking into account the cleaning mode, the tools being used and the floor type. The display also reminds you when to clean the filters and lets you know if there are any blockages. It even tells you how to clear them. 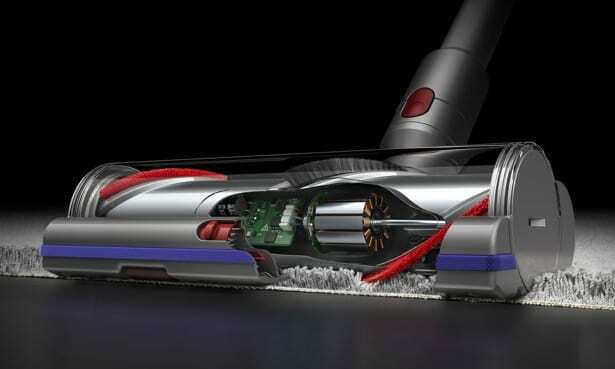 Dyson says the V11 has 20% more suction than the V10. It can go further, too, lasting a full 60 minutes in floor cleaning mode (on the eco setting). That’s an improvement on the V10, which can only manage around 45 minutes. This makes the prospect of a whole home clean a real possibility for larger households. This extra run time does mean it takes an hour longer to charge than the V10, V7 and the V6, though – around four-and-a-half hours. At the core of the vacuum is its upgraded digital motor, which now has a triple diffuser to improve performance. Dyson says the first two diffusers straighten airflow and reduce turbulence, helping to increase suction, while the third diffuser aims to reduce noise levels. 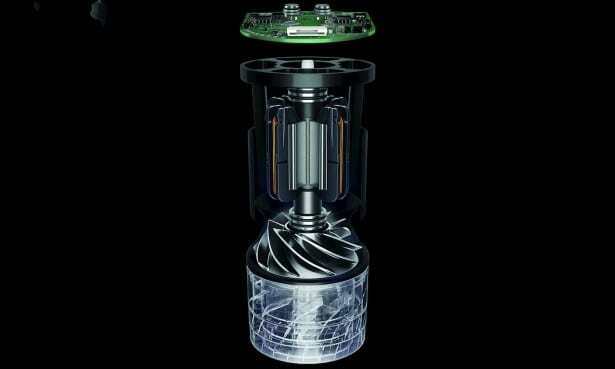 The motor also uses pressure sensors to report information back to the microprocessor – the brain of the vacuum – at up to 8,000 times a second. You’re then alerted to any issues via the digital display. The more expensive V11 Absolute model has an extra trick up its sleeve: auto mode. This only kicks in if you have the high-torque floor head attached, and automatically adapts to different floor types to achieve the best cleaning results and optimise battery life. The floor head has an extra digital motor built in and measures resistance to determine how much power is needed. A simple but useful addition, the new accessory clip slides on to the cleaning tube so you can carry two mini tools, such as the crevice tool or upholstery brush, around the house. It may not be revolutionary, but it does save you from having to traipse up and down the stairs, or back and forth from your car when you need to clean in a tricky corner. The V10 weighed a sprightly 2.6kg, while the V11 weighs in at just over 3kg, thanks to that bigger battery. This is still pretty average for a cordless vacuum, so we don’t think it’s a big worry, but it’s worth making sure you’re comfortable with the load, especially now you can clean for longer. You still need to hold the power trigger down continuously while cleaning with the V11. Dyson says this is to preserve the battery. That may have rung true on early Dyson cordless models, which had a max run time of 20 minutes, but it feels harder to justify when you can potentially clean for an hour or more. Plenty of competitors have a small latch you can swing round to hold the trigger down, or a simple on/off button. It would be nice to see Dyson offer the option for those who might find it tiring. OK, we’re nitpicking here, but if you’re going to pay top whack for a cordless vacuum, some headlights wouldn’t go amiss. Again, many rivals have LED headlights as standard, even vacuums costing £250 or less, such as the Vax Blade 2 Max and Hoover H-free. While a cordless vacuum that cleans well is our top priority, we’ve found headlights can be useful for spotting stray crumbs. Cyclone V11 Animal (£500) The entry-level model. 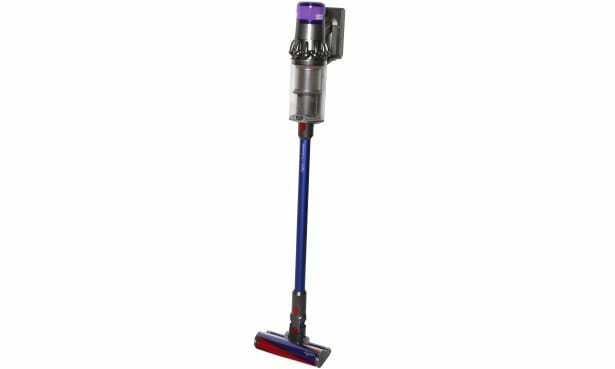 Comes with Dyson’s direct drive floorhead and a mini pet tool, combination crevice tool and stubborn dirt brush. There’s no auto mode, but it has a medium power mode instead. Cyclone V11 Absolute (£600) Torque floorhead, auto-cleaning mode, an extra soft roller brush floorhead for hard floors, and a mini pet tool, soft dusting brush and combi tool. Should you trade up to the V11? With a hefty price £600 for the top-end model, the V11 is the most expensive cordless vacuum you can buy. Whether you’re willing to splash out really boils down to how keen you are on the auto-cleaning mode. The V11 Animal launches for the same price as the top-end V10 Total Clean model, so it could well be worth trading up to get more cleaning time and the new digital display. You could also hold out for price drops on older models, such as the V8 and V7. The price of the V10 has remained stable since its launch last year, but we’ve seen the cost of other Dyson vacuums fluctuate considerably. *All figures based on our tests, apart from for the V11, which are claimed run times. Turbo run time for V11 is based on using torque floorhead, for mini tools it’s five minutes. How does the Dyson V11 compare with rivals? The V11 has managed to bring some unique features to an increasingly crowded and competitive market. The digital display, in particular, with its precise battery countdown, sets this vac apart. The auto-clean mode is also a potentially time-saving extra. It’s not the only cordless vac we’ve seen that adjusts suction power as you go, though. The AEG FX9 Ultimate has auto suction, a lengthy run time of around 70 minutes on the lowest setting and LED lights on the floor head. It also costs £200 less than the V11 Absolute. Check our full AEG FX9 Ultimate review to find out if it gets the fundamentals right and cleans well, too. You don’t need to spend a fortune to get a great cordless vacuum. We’ve found Best Buys for less than £250. Head to our round-up of the best cordless vacuum cleaners for our top picks. Dyson Cyclone Dok: an alternative to the wall mount? 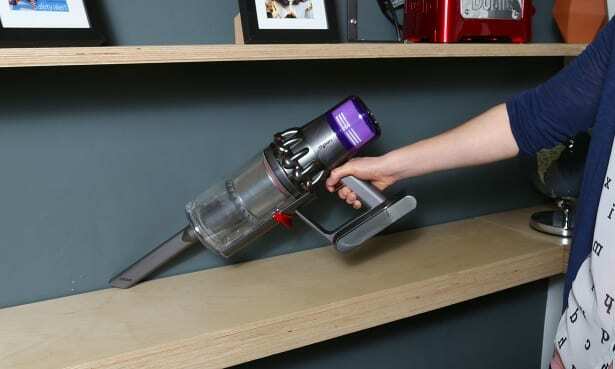 Neither the V11 nor the V10 can stand by themselves so if you don’t fancy drilling the dock into your wall to charge or leaving your vacuum in pieces in a cupboard, Dyson has launched a new vacuum stand, called the Dyson Dok. The docking station will give you a place to neatly store your vacuum and accessories – and also comes with an additional five tools including a mattress-cleaning tool and a mini soft dusting brush for furniture and blinds.